One of my favorite things about this blogging thing, aside from getting to talk to all sorts of interesting people, is getting to talk to interesting people who also make good music. When I started this site, one of my goals was to get to know more about local (or local-ish) music, and because of that, I’ve been lucky enough to be introduced to all sorts of great bands who may not be in the national spotlight yet, but who are out there making great music and doing what they love. Nightjar is a sextet based out of Indianapolis (see, local-ish), which formed in 2007 as a duo and quickly gained members after that. 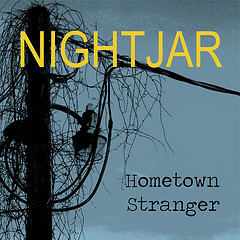 With influences such as the Old 97’s, Wilco, and Ryan Adams, Nightjar has a decidedly alt country sound, but the music is so much more than that. Nightjar isn’t afraid to push the boundaries of their sound, sneaking in elements and instrumentation that you might not be expecting. The second track of the album is the first inkling you get that this isn’t just a strict rock album. “Sweet Brandywine” has some great big jazz horn arrangements that had me hooked from the start. The lead vocals on that song are evocative of Tom Waits or maybe Van Morrison, a very gravelly, world-weary sound. The songs veer from genre to genre. Some are a little more country, some are just great songs to rock out to. The song “Slow it Down” does just what it says it’s going to do: after starting out as a brisk alt country tune, it unwinds by the end, letting the album have a slower pace for a bit as it leads into “Dowagiac”, which is maybe the closest thing to a ballad that you’ll get out of this band. The tempo kicks back up with the next track, “Figurine”, and keeps going through the end of the album. “Lonesome Whistle”, the closing track, starts out as a bare folk song, complete with banjo and all, and then gets a little more country, and even a little blues-y, before returning back to that sparse instrumentation to wrap everything up. Thanks for the kind words Sarah! I will send you some video of our release show that included the horn section sometime soon!